After graduating from The University of Michigan with a BFA degree in Fibers, Marianne Fairbanks went on to study textiles at The Kyoto Seika University in Japan. She continued her travels across nine countries in Southern Africa before returning to the US to earn an MFA in Fibers and Material Studies at The School of the Art Institute of Chicago. There she began working collaboratively with Jane Palmer under the moniker of JAM, a collaboration she continues today. JAM’s work has been included in major exhibitions throughout the United States. Fairbanks cofounded Mess Hall (2003-2013), an experimental cultural space in the Rogers Park neighborhood of Chicago that sought to cultivate communities through workshops, symposia, and exhibitions. She was also cofounder of Noon Solar, a small business that created sustainable bags and totes that incorporated flexible thin film solar panels to charge cell phones and mp3 players, a business that grew out of one of JAM’s projects. Fairbanks is an assistant professor in the Design Studies department at the University of Wisconsin – Madison. Her work has been shown nationally and internationally in venues including The Museum of Art and Design, NY, The Museum of Contemporary Art in Chicago, The Smart Museum of Art, Chicago, and Museum London, Ontario. 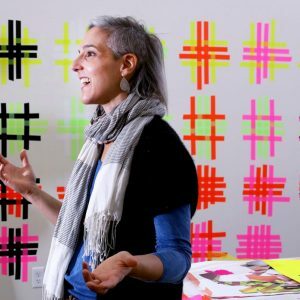 Her current work is focused on the intersections of weaving, mathematics, and technology.